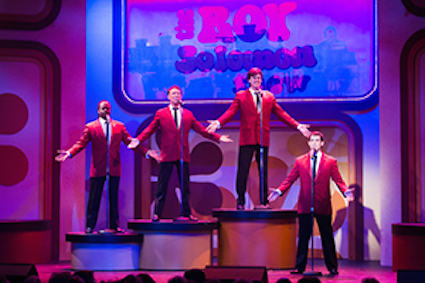 Michael Clark, Michel LaFleche, Gerrad Everard and Yvan Pedneault in Legends … of Rock ‘n’ Roll, in the 2015 Season. Photographer: Hilary Gauld-Camilleri. GRAND BEND – I have been very fortunate to catch every musical offered at the main stage of the Huron Country Playhouse in Grand Bend this season. I was wondering if Artistic Director Alex Mustakas’ most recent creation (yes, he dreamt up, wrote and directed the Legends . . . of Rock ‘N’ Roll) would be a favourite as it would be hard to top the other shows, especially Chicago. Yet this musical flashback of the tops tunes from the 50s, 60s and 70s had me dancing in my seat on opening night! The theatre was packed again and as soon as the audience finished the traditional Huron Country Playhouse “one-clap” recognition of the sponsors, the lights dimmed and the audience was taken back to a more simple time with old advertisements and other video footage playing on two retro televisions on either side of the stage to set the mood. The premise of the show is a popular television host, Roy Solomon, is signing-off after 20 years. The “theatregoers become the live studio audience” who get to relive the best moments of the show. 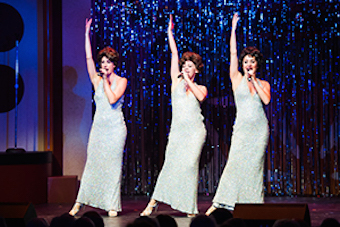 Laura Mae Nason, Jennifer Kee and Valerie Stanois in Legends … of Rock ‘n’ Roll, 2015 Season. Photographer: Hilary Gauld-Camilleri. from music history. One cast member who really stood out to me, Yvan Pedneault, was able to capture so many different musicians beautifully but two that really moved me were rendition of John Lennon’s “Imagine” and Simon and Garfunkel’s “Bridge Over Troubled Waters”. My parents used to play Simon and Garfunkel to help me sleep when I was little. Right away, I was impressed by the vocal strength of Christine Glen in “Proud Mary”. This continued in “Son of a Preacher Man” and my favourite, “Respect”. Jennifer Kee nailed Janis Joplin’s “Me and Bobby McGee” and, along with Laura Ma Neson and Valerie Stanois, brought The Supremes hits to a cheering audience. Lee Siegel has such a rich voice that he had the audience singing along to “Mony Mony” and “Pretty Woman” to name a few. Gerrad Everad had the audience in stitches over his Mick Jagger portrayal and rocks the keys as Jerry Lee Lewis. Michel LaFleche does it all from the rockin’ Chuck Berry to softer hits from The Lovin’ Spoonful. He teams up with Pedneault as Sonny and Cher…words can not even describe the comedy when those two are together. Michael Clarke goes from Stevie Wonder one minute to Ray Charles the next. His voice changes ever so slightly for authenticity of the artists. A warning to those who end up with front row seats. You may become a part of the show as De Rose selects audience members to be past American presidents and one First Lady. Two lucky ladies were picked out by the performers and became the focus of their amorous songs, which provided the rest of us some great laughs. Fortunately, the audience members did not seem to mind in the least little bit. The ensemble encouraged audience participation throughout the show and I did not hold back! Clapping to the rhythm of each song and singing along when appropriate (okay, maybe singing very quietly along with the cast to most of the songs) secretly hoping that I would be pulled up to dance with one of the cast members. I look forward to seeing what this talented ensemble will be performing in for the 2016 Drayton Season. Did someone say Mama Mia?! Legends . . . of Rock ‘N’ Roll runs through Aug. 29. Regular performance tickets are $42 for adults; $25 for youth under 20 years of age. Tickets can be purchased in person at the Huron Country Playhouse, online or by calling the Box Office at 519-238-6000 or 1-855-drayton (372-9866).